Do you ever share your mascara with someone else? Ever go to a store where they have samples of mascara, and try some on before you decide which color to buy? If you have, chances are that you also received the gift of “eyelash mites”. Eyelash mites (Demodex follicuorom and Demodex brevis) are parasites found in the follicles of our faces. They can be found in the nose, cheeks, and particularly in the eyelash area. These mites are so small that they cannot be seen with the naked eye, and up to 25 mites may be found on one single eyelash follicle. They are most active at night because they do not like light. The elderly are much more likely to carry eyelash mites, because of their weakened immune systems. About a third of children and young adults, and about half of adults also carry them. 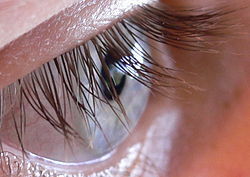 Women, who wear a lot of mascara and eye makeup, tend to have higher numbers of mites on their eyelashes. Not washing your face before going to bed could also be a contributing factor. Some say that 50 percent of Americans have eyelash mites because they sleep with their makeup on. Doctors don’t usually treat for eyelash mites, unless they see signs of irritation, inflammation, or infection. When the number of mites is excessive, the condition is called demodicosis. Some people will also have their eyelashes fall out when they experience demodicosis. If you suspect that you are having a problem with eyelash mites, you should make an appointment to see your doctor. While you’re at it, take your spouse with you and have him or her checked for demodicosis. Dogs can be vulnerable to eyelash mites (D. canis), so it is a good idea to have them checked, as well.